Barbara Modic; Words of Remembrance – Barbara M. Modic MD, Inc.
Barbara M. Modic MD, Inc.
Barb’s life touched so many people; family, friends, patients. She’d be happy to see all of the faces here today. We could hardly go anywhere in Youngstown without meeting someone who greeted Barb; and told me how wonderful she was. Barb grew up in Cleveland, in a Slovenian neighborhood. She was proud of her Slovenian parents and Slovenian heritage. She learned the Slovenian language as a child, as well as German. It served her well to speak other languages. Occasionally, she would search to remember a word in English, as we all do. When I helped her, she’d say, “See, when you only know only one language, you can know all the words”. Later in her life, she attended medical school in Ljubljana. In Ljubljana, she touched a whole new set of lives; family she’d never met and new friends in Austria and Slovenia. They helped her cope with life away from home in a very different place, and she came to thrive there. She gave some thought to staying after medical school; but she wanted to come home. There are Masses being held for her in both Austria and Slovenia, requested by friends and family there who loved her. Back home, she started an internship at St Elizabeth Hospital in Youngstown. When she finished she opened her practice in Austintown. Barb loved her medical practice, and serving the all of the people who came to her. Barb was always involved with her other love; singing. She joined the church choir at St Mary’s in Cleveland as a child, and sung in many choruses till now serving as President of Stambaugh Chorus here in Youngstown. Some of her best memories from medical school are singing with the chorus “Consortium Musicum Ljubljana”. She met lifelong friends with the chorus there. I was introduced to Barb by good mutual friends. I was very lucky. We were married and we recently celebrated our 15th anniversary together. We were very happy. 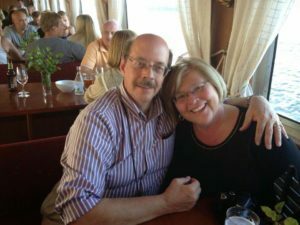 Barb worked hard at her medical practice, but made time for travel together. Her favorite destination was back to Austria and Slovenia. We were there this past May for her aunt’s 100th birthday. She fought the cancer very bravely and always with a positive outlook. She dealt with the many complications without complaint. Her passing came very suddenly. Her many friends and colleagues helped her through the ordeal. I’m certain they have her gratitude, and they have my gratitude for all their support. Moja draga žena. She left us too soon. Click here for photos of Barb. © 2019 Barbara M. Modic MD, Inc.